You probably already know Joanne, the owner of the Mad Hatter Antique Shoppe on Clinton Street. But if not, let us introduce you. Joanne was born into a family that had their own business. Growing up however she had a couple of her own dreams. For one, she loved decorating and even dreamed of decorating windows like you would see in NYC on 5th Avenue during the holidays. The second dream was to open a boutique. Years later these dreams would find their way back into her life when she started her own antiquing business. A business which oddly enough, all began with the purchase of something as simple as an old wood shovel which she immediately resold. It was so much fun that she started buying antiques which she would then sell out of her home once a month to other antique dealers. After about a year, the time was right to open a shop on Clinton Street. And so the Mad Hatter Antiques was born with $40 in hand and the antiques Joanne brought from home. Today when you walk through the doors its plain to see that her dreams of decorating and having a boutique are in play. Every room is carefully decorated adding to the story of each piece. It’s no wonder that theatrical and even movie companies have come here for ideas, antiques and even to film. 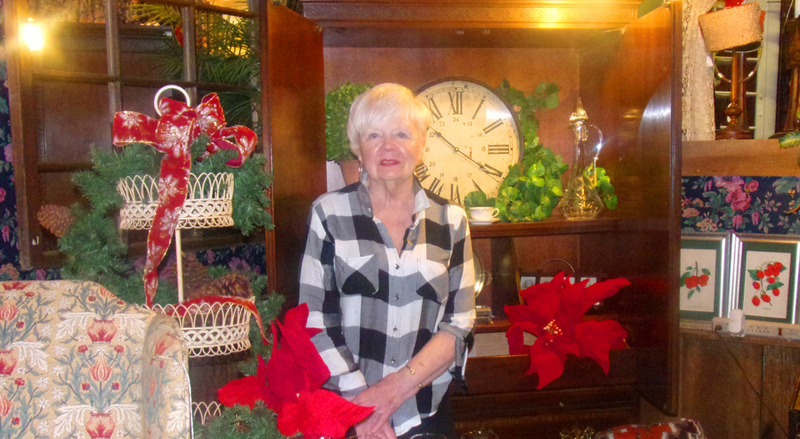 Joanne’s been part of the great antique scene on Clinton Street for 31 years now. She never knows what items will come through her doors next, but she’s always assured, when she hears the bell ring as the door opens, it’s announcing a visit from one of her many friends.